Reza Sarhangi (1952–2016), professor of mathematics at Towson University, was a devoted mathematician and an artist. Reza's passion, his inspiring obsession and his vision of crafting and connecting the fields of mathematics and art have transformed and touched the lives of many people around the world. For communities, teachers, students and those he inspired around the globe, Reza's passing is a reconciliation and celebration of mathematical art. With his depth of knowledge and understanding of the history of mathematics, we will remember Reza as an innovative person with a complex creative personality who devoted his life to math education and its connection to art, science and culture. Born on 21 July 1952, Reza Sarhangi was the son of Abdul Hamid and Massumeh Eskandri. He grew up in the shadows of political instability and social change in one of the world's oldest civilizations, the Islamic Republic of Iran, also known as Persia. In his formative years, he was encouraged to learn mathematics, philosophy, astronomy, architecture, theatre, music and poetry from mathematicians and artists like Muhammad ibn Musa al-Khwarizmi and Omar Khayyam. He understood the power of ideas and innovation driven by the study of interdisciplinary areas, and the value of sharing and disseminating knowledge to the global community. Reza wrote his first theatrical piece, ‘Dry The Swamps, Mosquitoes Will Die’, in 1969 during his high school year. It was directed by his dear friend, Reza Kianian, an Iranian writer and actor. Throughout his life, Reza drew upon his broader understanding and practice in music, theatre and poetry. He was influenced and inspired by his wife Mehri Arfaei, who was also a mathematician and a theatre artist. After immigrating to the United States in 1986, Reza completed his Ph.D. in Applied Mathematics from Wichita State University. For many years, Reza was a professor at Southwestern College in Winfield, Kansas where Reza and Mehri, together with their two daughters, Maryam and Mona Sarhangi, became the hosts of Reza's many endeavours and innovative initiatives over decades. The Bridges Organization was one of Reza's visionary endeavours, born out of his passion for shared and broad interests in the interdisciplinary crossroads where mathematics, arts and science meet. The annual Bridges conference (http://www.bridgesmathart.org), which started in 1998 at Southwestern College, has now become one of the largest interdisciplinary conferences in the world. For the past 18 years, mathematicians, artists and scientists across the globe have been coming together to explore and discover new ideas. Since 1998, Bridges has travelled to North America, Europe and Asia and has attracted participants from over 30 countries. It features invited speakers, full and short papers, educational workshops, a mathematical art exhibition, a theatre and music night, poetry readings and other art performances. The Family Day event at Bridges hosts adults and children from the local community, inviting them to participate in active learning and engaging in interdisciplinary fields of study. For more details about the history of Bridges, see the recent Mathematical Intelligencer article by Kristóf Fenyvesi . Bridges was Reza's true work of art. He invited scholars and created programs that inspired teachers, students and the general public. Through the Bridges conferences, he created a community that has been deeply involved in developing new ideas and inspiring new generations of mathematicians and artists. His exceptional generosity, infectious smile, sense of humour, his intellect and his ability to bring people together in the broader field of interdisciplinary studies made him a widely respected scholar around the world. In recent years, Reza was working towards his future vision of establishing ‘A Bridges Center for Mathematical Connections in Art and Science’ in Baltimore, Maryland. He foresaw the centre becoming a remarkable model as an educational umbrella, which can provide support for STEAM (Science, Technology, Engineering, Art and Mathematics) education for educators and scholars around the world. In Reza's words, ‘It is profoundly important to develop innovative ideas for mathematics and science education via the arts and technology and should be welcomed in the classroom of the 21st century’ . He believed in creating new collaborations with scholars and the community, offering hands-on activities and developing programs that use art as a medium to engage students in mathematical concepts. Reza was also instrumental in helping to found Journal of Mathematics and the Arts. He instigated the early discussions at Bridges conferences about the need for a journal. He contributed to the creation of the formal proposal to Taylor & Francis and then served faithfully as an associate editor from the time of the journal's founding until this year. Reza's passing on 1 July 2016, following a long series of heart surgeries, has stunned the worldwide mathematical art community. Reza lived with his heart problems for over 28 years. Today, we celebrate his life, his passion, his dedication, his commitment to exploring Persian geometry, and his inspiring obsession with connecting mathematics, arts and science to the global community. Reza's favourite musical instrument was the Persian ‘tar’, meaning ‘string’, which he often played (Figure 1). His passion for and obsession with poetry and his lifelong devotion to the study of geometry in Persian art will always be celebrated. Reza's lifelong legacy of the Bridges organization, together with MoSAIC (Mathematics of Science, Art, Industry and Culture, a series of public events for exploring mathematics) and his grand vision of a future Bridges Centre will forever inspire many younger generations of mathematicians, artists and scientists. Figure 1. 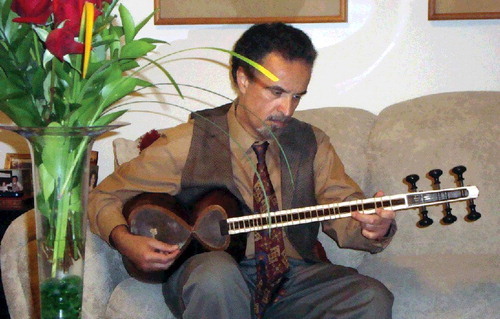 Reza Sarhangi playing his favourite Persian musical instrument, the ‘Tar’ (‘String’). Photo Credit: Puya Shakiba. Reza's last artwork (http://gallery.bridgesmathart.org/exhibitions/2016-bridges-conference/reza), included in the Bridges 2016 art exhibition and titled ‘Tray of Love’, is engraved with a message to his beloved Bridges community (Figure 2). 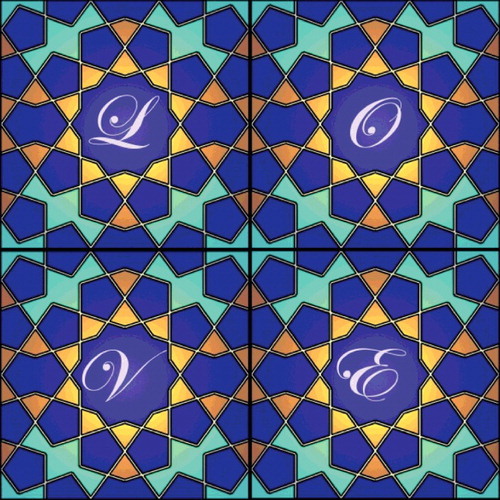 In this artwork, the word ‘love’ is embedded in a field of Islamic geometrical shapes to create a tray. He wanted this tray to be visible to family and friends. This final message, which brought him comfort and peace, will forever remind us of Reza's strength and the size of his spirit, which lives on within us. Figure 2. Reza Sarhangi's mathematical artwork, ‘Tray of Love,’ from the Bridges 2016 art exhibition.